Our Mission: Pelican Valley Senior Living is committed to providing comprehensive, high quality healthcare and residential services in our community. Our Vision: The highest quality provider of person centered health and wellness services for those we serve. The Pelican Valley Health Center Hospital District was formed in 1977. It currently consists of a 36 bed Medicare certified skilled nursing facility; a 20 unit assisted living facility, Riverfront Manor; a 25 unit assisted living facility, Riverfront on Main; and provides rental space for several community service providers. Organization to build a hospital was begun in July 1945 and the Pelican Valley Health Center was built in 1951. The Health Center expanded in 1963 to include a 20 bed nursing home. In 1969, an additional 26 beds were added to the nursing home. The hospital portion was remodeled and a clinic addition was built in 1979-1980. The clinic portion was expanded in 1988. The clinic was rented out until June 1991, when the Health Center took over management. The hospital was closed April 1, 1993. In August 1997, the Health Center leased the Clinic to Heartland Health Systems. At that time, the Health Center also entered into a management agreement with the Board of Social Ministry, now known as Ecumen, for management of the Health Center. In February, 2002, MeritCare, now Sanford Health, began leasing the clinic. The vacated hospital portion of the Health Center is being rented to several community service providers. In June 2002, the Health Center began providing housing with services through Riverfront Manor, the assisted living facility attached to the existing nursing home. On June 1, 2013, the Health Center took over ownership of the Good Samaritan Society Senior Living Center. The facility transitioned to Riverfront on Main and offers 24 hour assisted living services. In October, 2015, Pelican Valley began its construction project at the nursing home. The project will add additional space to our nursing home to allow us to have more private rooms in a more modern facility. On January 4th, 2016, Pelican Valley began a new partnership with Children’s Corner child care center. The daycare serves children 6 weeks to preschool age and operates out of our main floor at Riverfront on Main. In late 2016, Pelican Valley Health Center transitioned its name to Pelican Valley Senior Living. 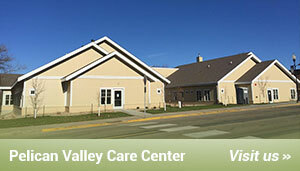 In January 2017, Pelican Valley Care Center opened its nearly $4 million addition. Pelican Valley Senior Living is proud to be professionally managed by Ecumen. Founded more than 150 years ago, Ecumen is one of the nation’s top 20 largest non-profit providers of senior housing and services. Dedicated to empowering individuals to lead richer, fuller lives, Ecumen prides itself on innovating and radically changing the way aging is viewed.